Ministers said they had "listened carefully" and decided not to proceed with the controversial "pay to stay" policy. It would have applied to social housing residents in England earning £31,000 or £40,000 in London. 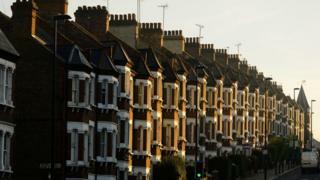 Councils and housing associations would be able to decide whether to impose higher rents, the government said. Housing Minister Gavin Barwell also said the government would be ending the right of council housing tenants to stay in their homes for life, by introducing compulsory fixed-term tenancies. The measure will only apply to new tenants. This will mean tenancies are periodically reviewed "to ensure tenants still need a socially rented home", he said, with councils told to prioritise lower-income households. He added that the government was exploring other ways to ensure higher-earning tenants "make a greater contribution to costs". The change in policy comes after a public consultation into "pay to stay" in which council leaders and charities criticised the plans. Under the current rules, social landlords can charge tenants with an income of over £60,000 market or near-market rent. Former Chancellor George Osborne announced a compulsory scheme in his July 2015 Budget, with the government saying it was unfair for hardworking people to be "subsidising the lifestyles of those on higher than average incomes". It would have meant local authorities were forced to raise rents with a taper system in place for those earning over £31,000 or £40,000 in London. More than 70,000 households were set to be affected by the changes, pushing tenants' annual rent up by more than £1,000 a year on average. In a written statement, Mr Barwell said the government remained committed to "ensuring social housing is occupied by those who need it most". He added: "But we need to do so in a way that supports those ordinary working class families who can struggle to get by, and in a way which delivers real savings to the taxpayer. "The policy as previously envisaged did not meet those aims." The Local Government Association was among the organisations warning families could be forced from their homes and unable to stay in the same area if subsidised rents were dropped, with the proposal also facing resistance in the House of Lords. The LGA said the decision not to enforce a compulsory policy would be a "huge relief to households across the country", saying implementing it would have been "difficult, lengthy and costly". Liberal Democrat housing spokesman Lord Shipley said: "Finally the government have realised their plans to charge people more for their homes were not only unfair, but unworkable." Correction 1 February 2017: This story has been amended to make clear that fixed-term tenancies will apply only to new tenants.